Back cover: "Gwyn Huntington knows how to throw a party. And Hunt Hall, her postcard perfect Victorian home in Montauk, is no stranger to celebrations. But on the morning of her thirty-fifth wedding anniversary, she's putting finishing touches on the last party she'll host there: A party to celebrate her divorce. Just over one hundred miles away, Gwyn's future daughter in law, Maggie Mackenzie, sits on the floor of her Brooklyn apartment attempting to organize her new life. She's in love with a wonderful man, and today she is meeting his family for the first time. The Divorce Party takes us into the lives of these two women at opposite ends of marriage. For all the differences between them -- distance, priviledge, age-- Gwyn and Maggie have one thing in common. Each has found herself at the crossroads, facing the same question: How hard should you work to stay with the person you love?" When Anna of FSB Associates asked if I was interesting in reviewing "The Divorce Party," I have to say I was intrigued. A party to celebrate divorce - couldn't imagine it. The story is told from Maggie and Gwyn's perspective and alternates every chapter. Gwyn and Thomas are getting a divorce because he has told everyone he wants to become a Buddhist and has been taking a lot of trips to retreats. He no longer wants to be married because it doesn't fit in with his new lifestyle. Their adult children are trying to be understanding but having difficulties when it seems their mother is angry and hurt. They think something else is going on. Why is Gwyn going to so much trouble to make Thomas's favorite red velvet cake and have a bottle of 1945 chateau Mouton-Rothschild flown in by private jet from Europe. There are many questions that Gwyn refuses to answer until the right moment. Maggie and Nate are struggling to open a restaurant and Nate has refused all monetary assistance from his rich parents. She is nervous about meeting his family. And when she does, she discovers several things about Nate after arriving in Montauk that make her doubt him, question her love for him. As each woman struggles with the truth, they discover the strength within themselves to believe in themselves and do what's right for them. The story is well told and the characters engaging. Thank you, Anna for sending me the book. 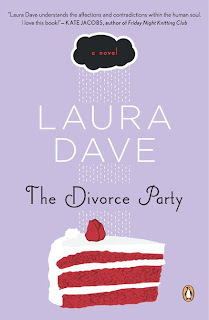 "When I picked up Laura Dave's second novel, I thought it would be a chick lit read based on the cover. I hesitate to label it as there was so much more to it. it was by turns funny, sad, poignant and hopeful. A fairy tale - no, but a definite page turner. You'll find yourself re reading some of the passages on relationships and thinking about your own." "This is definitely a book written from a woman's point of view and it is extremely touching (and I HATE to cry when I am reading)." "Dave is a very gifted story teller. She keeps you hanging at the end of every chapter. You do have to read chapter in succession because they build upon each other. Dave makes you feel as if you are right there at the side of each character watching the story unfold. It is the way these 2 women analyze their lives(past, present and future) that makes the reader get sucked in."